Bonjour! While I never took French whilst in school, I am excited to be doing an all French DJ set with the Music Makes The Difference fam! This will all be going down at Verdugo Bar on Wednesday, December 8th. There is NO COVER and you're bound to be entertained! 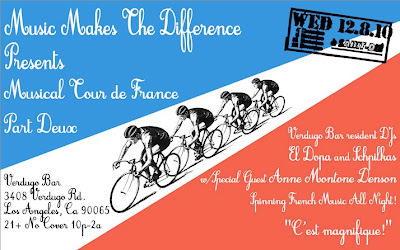 Plus the LITTLE FRENCHIE FOOD TRUCK will be there, cause we know how important food is at a French-style celebration! Expect to hear classics from the great chanteurs of the 1940s & 50s such as Edith Piaf & Lucienne Boyer, all the way up to the contemporary forrays into electronic music from the likes of Air & Daft Punk. Ooh lah lah, y'all!!! SEE YOU ON THE 8TH!! The Music of France, the Return!